Shocking, but yes -- another update. Two reasons for this. One is that I got Stuff! In the Mail! I'm relatively new to the Lead Adventure Forum, and as time allows, I've been catching up on some of the great projects documented there. One of my favorites, and most inspirational, is that of DeafNala. If you like colorful, high fantasy, with some hints of oldschool (circa 1980s) Warhammer & White Dwarf miniatures, and comics like Gobbledigook, the art of Froud, Bode, Bakshi, etc. then check it out. All of it. Somewhere around page 201 there is a link to a Photobucket account full of photos, too. Somewhere in response to my praise and worship, I received an offer of some mushrooms, and a significant batch of both painted and unpainted ones recently showed up on my doorstep. They're even better in person! So now I'm churning around several plots on how to make use of them on my own gaming table. I'm a little intimidated about painting the unpainted ones, so I am trying to decide on a good way to paint them so they are different, but work well with DeafNala's own painted 'shrooms. I have also just sacrificed some more of my much needed sleep in return for some much needed painting time. I really wanted to finish up one other thing of my own that's been sitting half-complete since... I don't know, spring or summer? I wanted a hodgepodge unit of beastman-esque skeletons. I painted half of them ages ago, and the rest included a few more that needed built, plus a few metal figures from the Cursed Company. There's a mix of figures & minor conversions here. Stock figures include a skeletal saurus, orc, and two skaven from the Cursed Company, and two skeletal dogs from Mantic. 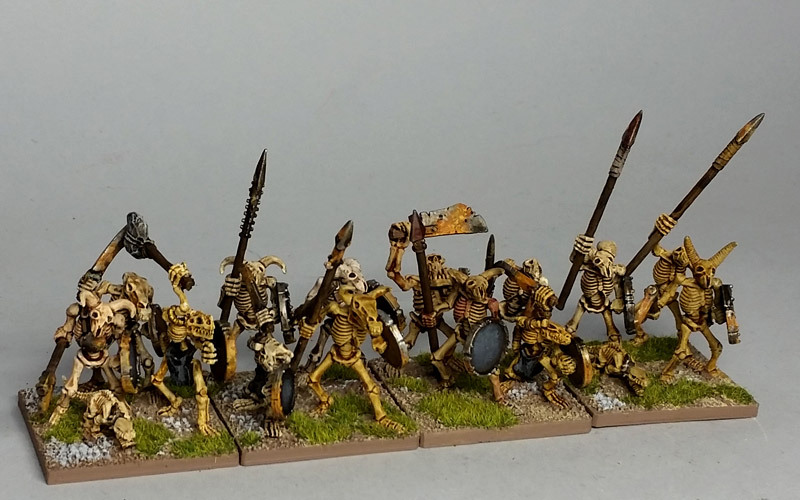 The rest are 4th/5th ed Citadel plastic skeletons with various additional animal skulls & bits. Now that I've got some undead out of my system (I had really wanted to finish a few more units by the end of 2015) I will move on to finishing a large scale hoplite I started a while ago and a few other things headed elsewhere. Those are great. Whilst the odd horned skull is quite common with skeletons, having a unit entirely made up of bestial variants adds interest to what can be a bit of a boring army. Yeah, I agree with Scalene on the skellie's too!